A letter to the editor of The Times (London) urges Italian authorities to pursue further excavation at Herculaneum's Villa of the Papyri. "The boundaries of the excavation remain what they were in 1998. The excavation must be finished." 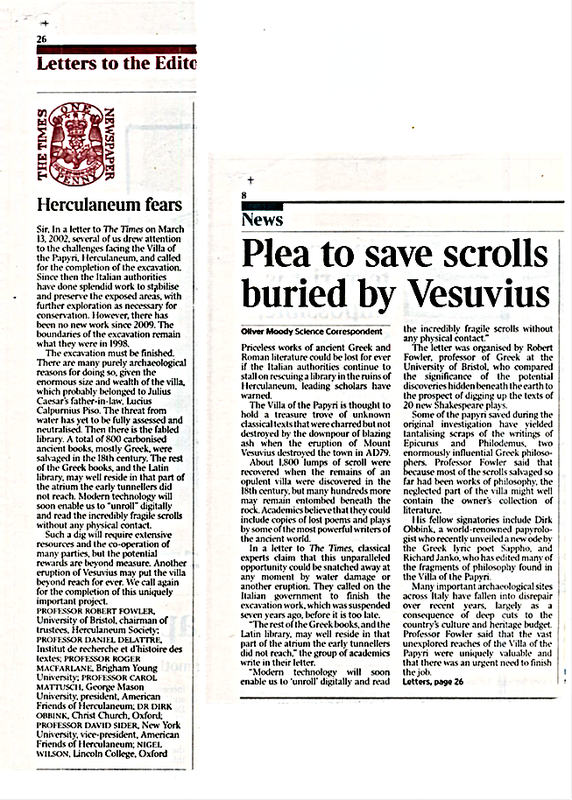 The letter was signed by several members of the American and British Friends of Herculaneum and published in The Times on 30 March 2016 (p. 26). The image below shows the letter in the left column and an accompanying story in the British paper The Daily Mail which adds brief statements from British board members Bob Fowler and Dirk Obbink with a statement by AFoH trustee Richard Janko. We encourage feedback. Respond to this blogpost below.